You have had hip replacement surgery and in recovery to regain strength and function for your every day activities. If you are in the first few months post hip replacement, then you are most likely following the exercise program your physiotherapists have given you at the hospital. After this two month period when your soft tissue is healing and when your surgeon and physiotherapist team give you the ‘graduation’ certificate to progress, it is time to progress your exercises. Yes, there is a progression of hip replacement strength exercises that will help rebuild your strength, stamina, and functional ability for the things you need and like to do in your daily routine. One leg exercises are extremely important to include in your post rehabilitation exercise program for hip replacements. The reason they are so important is that the leg you have hip osteoarthritis in has become weak prior to surgery due to inflammation, pain, lack of mobility, a decrease in use, and instability. Add to all that the trauma the muscles and joint endured during surgery and that poor hip joint needs some serious exercise TLC to get it back to your spry regular hip self! What you may have noticed already is that the non operated leg has become quite strong taking on all the load for you and has developed an unconscious pattern of doing all the work. This is a muscular imbalance in your body and a motor pattern we need to correct! What are the Best 1 Leg Exercises for Hip Replacement Treatment? There are many one leg exercises you can choose from to do as part of your post hip replacement strength exercises program. However, there are a few basic exercises I would recommend starting with before proceeding to any advanced exercises. I will include in this list exercises you can do both at home and in a weight room, but know you do not need to go to the gym to begin these one leg exercises. The timing of when you begin one leg exercises really should be monitored by a professional such as a physiotherapist, kinesiologist, or personal trainer with specialized training. There are actually many individual factors personal to you that impact when it is okay to begin one leg exercises. If you are frail, a large frame or overweight, or have little muscular strength and stability at your hip, you may need to progress with non weight bearing exercises first before beginning with these. 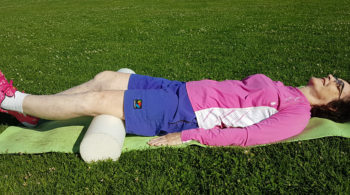 When you include one leg exercises in your exercise program post hip replacement surgery, it will absolutely help you regain strength and function. The technique at which you do each exercise is extremely important. In fact, activating your core and making sure you have core stability while on one leg is mandatory. Have a personal trainer show you how to do these exercises correctly or learn the correct way to perform each exercise with the Hip Replacement Exercise program. If you are someone who walks a lot, is very active, wants to return to a sport like Golf or hiking, then you will definitely benefit from one leg exercises. Consistency of doing your hip exercises and making sure you do not do too much exercising are equally important. How often should I do my one leg hip strength exercises? Implementing your one leg hip strength exercises three times a week is best, but you will also see results with twice a week. It is important to have rest days between your exercise sessions. How many one leg exercises should I do per exercise training session? I would recommend having two one leg strength exercises in your hip replacement exercise program. You could choose one non weight bearing one like the shuttle and make sure to have at least one functional exercise as well like the step ups. In addition, I would add in at least 1-2 one leg balancing exercises. When you first start the one leg balance exercises, make sure to have a spotter or poles or be near a bar or wall so you can hold on to avoid any falls or injury. It’s now time to get started! Start by adding in just one strength exercise and one balance exercise on 1 leg and see how it feels! To learn more about hip replacement exercises and the complete pre and post hip replacement exercise program, go here. If you are a personal trainer wanting to learn more about how to train hip replacement clients pre and post operation for optimal recovery, visit us here to see the Joint Replacement Course for Personal Trainers.